Faith and industry. Not faith in industry, since that is an entirely different topic for another time, but Faith and Industry. These are the building blocks that placed my family and ultimately, me, in the path of the divine closed universe. You see, I come from a very important place in the United States that no one outside of this city even regards as mildly interesting. Pawtucket, Rhode Island is the town where I was raised. Where my cousins, aunts, uncles, and parents were raised. That is not the significance to the nation my town provided. Pawtucket is the birthplace of the industrial revolution. As I heard countless times in my childhood; the very first weaving mill was built on the Blackstone River by Samuel Slater right in Pawtucket launching the industrial revolution and independence from the mills in England. The town grew up around the mill, and my family with it. To work in the mills that peppered the streets along the river, migrant workers flocked to the Blackstone Valley area looking for a chance at a new life and work to support it. My great-grandparents lived and died by the mills. The LeClair side migrated from France’s southeast provinces. Where exactly, I don’t know, but I do know he changed the spelling of his name from LeClerc, translated as “the clerk” to LeClair, “the transparent.” According to my father, he grew tired of being called “Le Clerk.” The two words are pronounced nearly identically, so he chose to Anglicize rather than fight it. He only did this after he moved to Pawtucket seeking work in a mill. He only arrived in Pawtucket after moving to Canada and marrying a French Canadian. On the St.Pierre side, my great grandfather was a few generations American, but the mills were his employer. With only an eighth grade education, he became an inventor. All of that time in the mills, he would draw the machinery and eventually began to design the adaptations that made possible cylindrical weaving. He’s the reason for seamless stockings all the world ‘round. Both of these men settled in a parish in Pawtucket – Saint Cecilia’s Church – the French church. Churches in Rhode Island, with its 60% Catholic population, were separated by nationality. St. Leo the Great less than 500 feet from Saint Cecilia’s was “the Irish Church.” Even the architecture was reflective of each parish. Each parish had a school and the children were brought up in the cultural traditions of that community. Never the twain did mix. My parents grew up in that same parish. The two families settled at St. Cecilia’s, in the Darlington section of Pawtucket. Darlington was, as it sounds, darling. A typical New England suburban neighborhood with 50’ x 100’ lots on well ordered streets that defined nationalized neighborhoods. The interesting difference was the double and triple decker homes the neighborhoods seem to be laden with the closer you get to the churches. Rental properties close to the communal epicenters. It was at this school and this neighborhood that my Grandfathers grew up. Years apart in age, their lives would intersect when my parents met. Pepere St. Pierre went to war, but not really. He joined the USO and had my great-grandmother sew weights in his shorts so he’d be taken on. He was a comedian and singer in WWII entertaining troops in Texas before they went off to war. My Pepere LeClair fought as a marine in the Pacific Theatre. He was an “island-hopper” who found his way into a 1944 National Geographic. These are the pictures I have of these men. They died when I was young; the Reverend Mister Maurice St. Pierre passed away when I was six. He was the head of the permanent diaconate in the Diocese of Providence. His faith was strong and strengthened by his time in industry. My grandfather was a supervisor at Raytheon in charge of the Hawk Missile Project. His guilt over being part of so much destruction (according to my mother) is what called him to the Diaconate when it was established in the late 1960s. His parish assignment was Saint Cecilia’s, his faith home. When I was nine, my Pepere LeClair died of lung cancer. He had never smoked a day in his life, but he lived his life in the mills before OSHA regulations were implemented. An active member of the parish, and hard-working man, he sent all five of his children to St. Cecilia’s School. My grandmothers lived far longer, in fact, my Memere St. Pierre is still with us. Memere LeClair passed away for the same reason as her husband. She was a skilled seamstress and made extra money to support the family with those skills. She and Walter lived in the same house for the entirety of their married lives, three blocks from the church. My sister owns it now with her three children. Memere St. Pierre moved all over Rhode Island after Pepere passed away. She is now living in elderly housing that just happens to be a converted mill. She was the only one not a mill rat. She grew up outside of Pawtucket in another mill town, Attleboro, Massachusetts. Her father was a firefighter supporting his family of fourteen children and his wife. My grandmother is the last of those fourteen. Industry and Faith have always been a large part of my life. 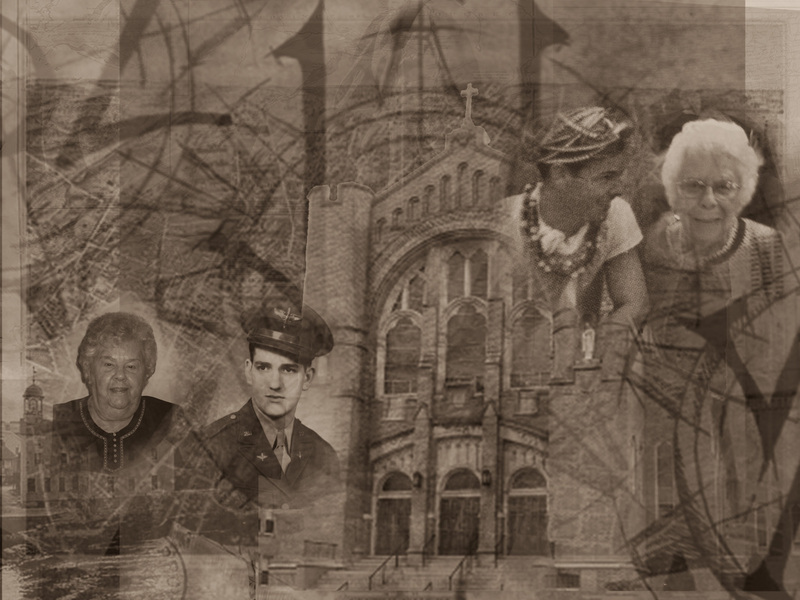 These four people, daughters and sons of French Canadian mill rats, met, lived and provided for their families in a way that allowed my parents to meet and for me to be here. I owe a lot to these two powerful forces and I pay homage to them whenever I can, even in my current logo for my artwork. It is a gear, or rather a planning sketch of a gear, with my initials upon it. My French Canadian Catholic faith and the industrial nature of cities along the Blackstone River fueled the migration of my heritage.